In this first article of our new series looking at the fauna and flora of New England, ONE examines the Red Fox. Do Red Foxes Simply Look Cunning? Many children’s books teach us of the sly and deceitful nature of the fox. In the Adventures of Pinocchio, the Fox and the Cat try to trick and then steal from Pinocchio, the Fantastic Mr Fox outwits his neighbors and steals their food and The Gingerbread Man ultimately is eaten by a fox. For generations farmers have complained about how foxes always seemed to outwit them leading to the untimely death of many a chicken. Even the English language gets in on the act with fox meaning a ‘clever crafty person’ and outfox means to ‘get the better of’ someone. But are these basic assumptions correct? When observed in the wild, Red Foxes appear to be extremely cautious. Like all canids (dogs, wolves, foxes, coyotes, and jackals) the Red Fox is capable of learning from experience, which could be one explanation for its reputation. Another is its appearance - a Red Fox can also simply look cunning. The Red Fox (which can also be black, black with silver tips and a reddish brown) can be distinguished from other foxes by their white tipped tail which is unique in North America. On average a Red Fox will be around 16” high, between 35” to 40” long, and have a bushy tail (which it uses for balance) of around 13” to 17” long. Red Foxes are difficult to observe, even in areas where they are common, as they are shy, nervous and primarily nocturnal. You can hear them barking here. Despite its reputation, the Red Fox, like humans, is an omnivore and eats whatever is available. This leads to seasonal differences in their diet. In the summer they are more likely to eat berries, apples, grapes, acorns and the like. During the winter months rabbits, squirrels and other mammals and birds are at greater risk. 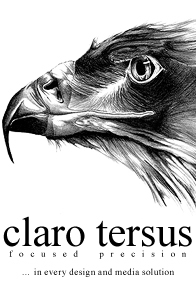 Perhaps surprisingly, they also eat grasshoppers, crickets, caterpillars, beetles and crayfish. 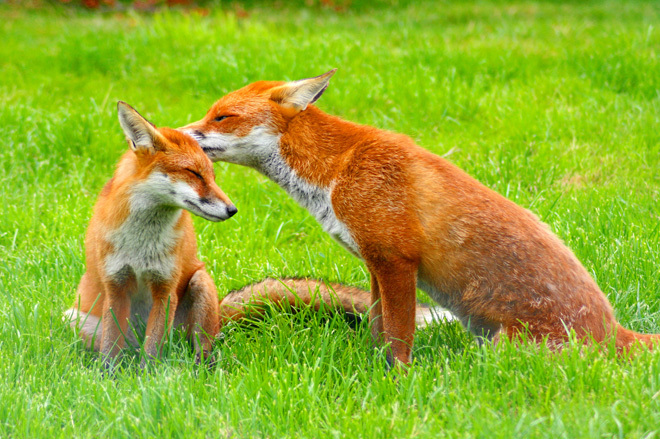 Red Foxes have unusual hearing in that they hear low-frequency sounds. 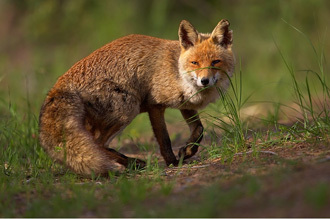 This is why Red Foxes often dig for their prey - hearing underground burrowing and rustling. 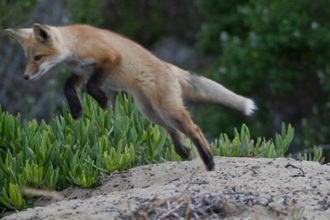 The Red Fox, despite having short legs, can run at up to 30 mph, so hunts larger quarry by stealthily moving in as close as it can before its intended prey bolts. Red Foxes adapt extremely well to changes in the weather, growing a thicker coat as temperatures drop and shedding to a thinner coat in the warmer months. Their fur is impervious to water, so they can still hunt when it is raining or snowing. 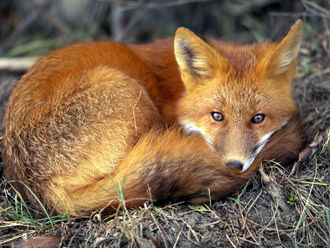 The greatest danger to Red Foxes are humans due to hunting, driving and diminishing their habitat, while their greatest natural threat in New England are coyotes and bobcats. Adults lead a solitary existence until mating season in January and February. After mating, a maternity den is dug, with the vixen (female) cleaning out additional dens in case she and the kits are disturbed. The vixen may have five to six kits with typically two to three surviving. The kits open their eyes after around nine days. Food is predigested by the mother, but soon live prey is brought into the den so the kits can practice killing. The mated pair are often assisted by unbred females or female progeny that have not left the male’s territory. The kits stay in the den for four to five weeks and then hunt with their parents until the kits disperse at around seven months. Males travel up to 150 miles away, while females stay much closer. For many years rabies, coyotes and the unregulated trapping of Red Foxes for their fur took a heavy toll on Red Foxes in New England. Hunting reached its peak in the thirties and forties when up to 5,000 Red Foxes were caught each year. But with farms now fox proof and the collapse of the fur industry, this most misunderstood of animals seems to be on the rebound. If there is a topic you would like to see covered in this series please contact us. All images are copyright their respective photographers, and ONE would like to extend our thanks for allowing the use of the photographs in this article.